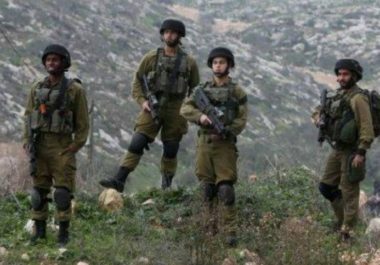 Israeli soldiers abducted, Monday, a Palestinian man and confiscated his road roller, while he was doing work for the Ministry of Agriculture to rehabilitate and prepare agricultural roads in the northern area of Deir Ballout town, west of Salfit in the occupied West Bank. Engineer Ibrahim al-Hamad, the director of the Ministry of Agriculture in Salfit, said the army, and members of the so-called Civil Administration Office of the Israeli occupation in the West Bank, invaded the area, and confiscated the road roller, in addition to abducting the driver. Al-Hamad added that the Ministry is trying to rehabilitate the agricultural areas, to link the Palestinian farmlands and make it easier for the villagers to access and work on their lands. He stated that the Israeli army is alleging that the work cannot be conducted without the approval of the “Civil Administration Office,” because the lands are in Areas B and C of the occupied West Bank. The head of Deir Ballout Local Council, Yahia Mustafa, said the agricultural road is located between Deir Ballout and Rafat, and was first opened 10 years ago, and added that the Agriculture Ministry has been working of fixing and rehabilitating it. He added that the soldiers confiscated the road roller, and abducted its owner, identified as Waseem al-Azzam, without even showing an order to halt the work. The soldiers also detained three landscapers, and two land owners while working in the area. They have been identified as Wisam al-‘Asal, Kamal Dweikat, Abdul-Rahman Amer, Naji Moqadi and Islam Musleh Moqadi.